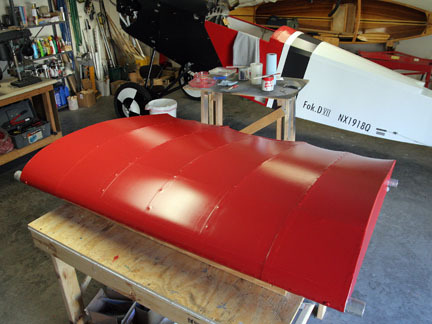 Red proved to be difficult to apply on the fuse over white primer due to its transparency. I had a quart of primer tinted medium gray for the red areas of the wings, this should be easier to cover. 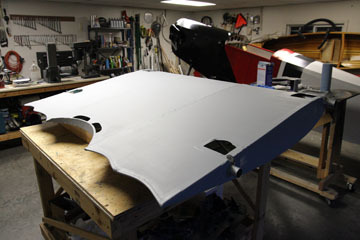 First wing to be painted is the top wing center section. I applied three coats of unthinned primer with a foam brush, each in opposing directions. The gray primer covers the green fabric adhesive so well I may be tempted to use it with white paint as well. The wing is now ready for color. Top wing center section is painted. Three coats of red yielded a consistent finish. All coats were applied with a 4" white foam roller and the paint was thinned ~10% with di-hydrogen monoxide. 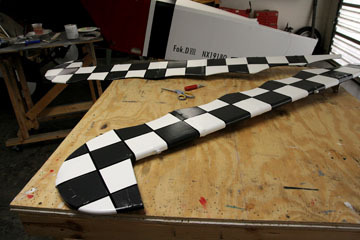 Lower wings are primed and ready for color. 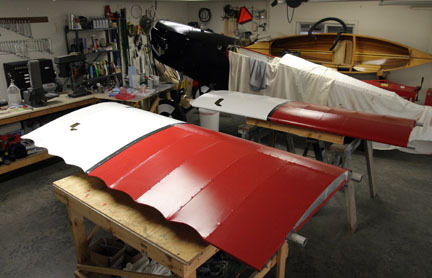 Red will go over the gray primer and white over the white primer. 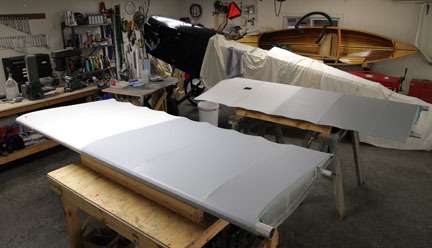 Two coats of gray primer and three of white were applied. 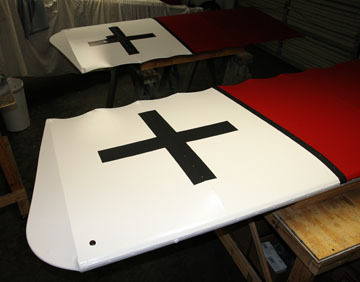 After two coats of color, the markings on the bottom surfaces were masked along with a black transition stripe between the white and red. The black dot near the leading edge is where a tie-down ring screws into a fitting on the spar. Top wings painted. All that remains are the ailerons. 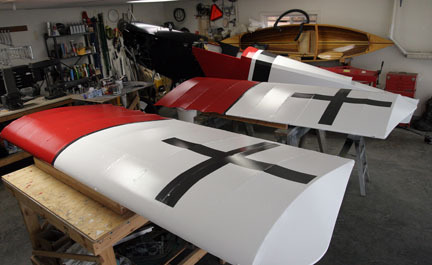 Ailerons painted...and paint phase complete.